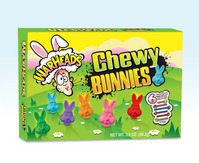 Warheads chewy bunnies make the perfect Easter basket candy for those who love gummy candy or sour candy. Each box of chewy bunnies comes in the 6 warhead flavors you have come to love. Orange, Watermelon,Blue Raspberry, Black Cherry and Green apple. You get a gummy bunny face covered in sour sugar perfect candy for those who like warheads. Each box is 3.5 oz, about 15 chewy bunnies per box.